Flamingo or South Biscayne Bay, You Choose! South Biscayne has been full of fun fish lately, all it takes is a live well full of Pilchards. I took my son last week because its been a while since we fished together. We got out early netted some bait and hit a few spots, all produced an assortment of species. Muttons, Yellow Jacks, Spinner Sharks, Jack Crevalles, Mangrove Snapper, Cuda’s, giant Houndfish, and finished it off with a Snook. We were home by 1230, this is a fun fishery give it a try! This African Pompano was pleasant surprise in the bay! I am with the Rosen Family today at Flamingo, Jeff who is an avid angler brought his wife and kids to experience the Park. It started out slow but we kept at it and started putting some fish in the boat. The caught a bunch of Trout, then Snappers and couple Goliath Groupers. We kept moving around and then it happened, Jeff’s son Scott hooked a big Snook the was running and jumping wild. It took a few minutes but we caught the 10 lb. Snook in and took a few pictures. It was 2 minutes later and Jeff was hooked up only this fish was staying down. This was a longer battle in an area littered with trees on the bottom. Jeff get up the pressure and a 25 lb. 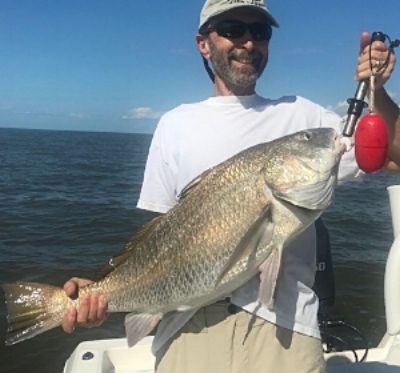 Black Drum came to the surface. We took more pictures and released the monster. There were loads of Ladyfish, Jacks and Trout caught today. We ended the day with a couple more Snook caught by his wife Cara. It was getting late so we called it a day! I am with Sean O'Neil and his son Ethan and Marvin Gardner at Flamingo. We Started out in Coot bay with a Few Snook, Trout and Ladyfish. We were trying to get the falling tide out in the Gulf of Mexico but had to make a few stops in Whitewater Bay first. The stop really worked out good they caught a bunch of Snook, Trout, Ladyfish and Snappers. Now its time to run out to the Gulf. The tide was extremely low, it was lower than I had ever seen on a couple areas. We worked the shallow shorelines hooking several Snook, Redfish, Trout and tons of Ladyfish. Marvin also had a Tarpon on for a second. 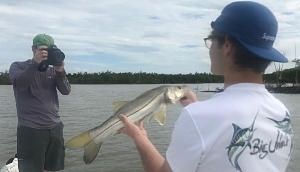 Ethan had a good day catching his fair share of Snook. All 3 anglers got Snook, Redfish and Trout to complete a Slam! On the way in I stopped at one last spot and after 10 or so Trout and a small Snook we called it a day. Newer PostGo fishing for Christmas! Older Post Go fishing on the Holidays!